Designing with a purpose. Boise may be best known for paper, but they are also committed to supporting local economies, communities and the environment. Evoke had the pleasure of bringing Boise’s Live, Work, Connect initiative to life in several avenues including printed materials, trade show displays and website design. 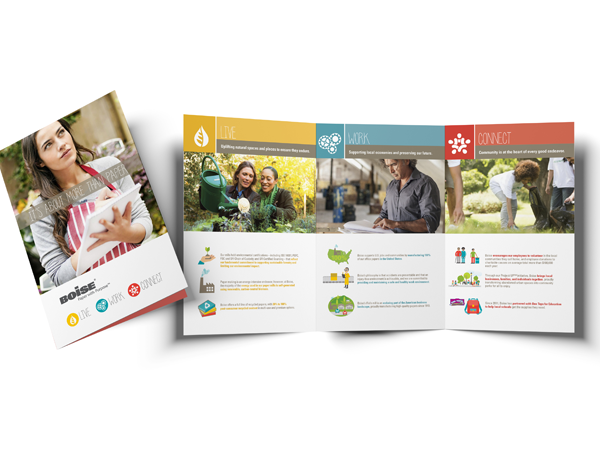 Evoke Idea Group’s work on the Live, Work, Connect brochure was acknowledged with a rare Grand Award in the Print Media Category from Communications Concepts and the APEX Awards. This honor is the highest recognition which can be awarded by the judges.